Churchill Meadows Community Centre & Park is located at 5320 Ninth Line, between Highway 407 and Sixteen Mile Creek to the West, and the Churchill Meadows community to the East. The City will be developing these lands as an all-season sports park with tournament-level lit sports fields, passive uses, a variety of outdoor amenities, natural areas and a community centre. The park is intended to be used by area residents and organized sports groups. It will be designed for all ages and abilities, offering a variety of recreational activities and neighbourhood amenities for year round use. Churchill Meadows Community Centre & Park will be developed in phases. For progress and updates, visit the project webpage. The design and construction of additional amenities will be determined in the future pending available funding. Uses identified through the public engagement process are being considered, along with the following proposed facilities subject to future available funding. The community centre is intended to provide multi-use spaces for recreation and community use. Uses for the community centre identified through the public engagement process are being considered, along with the following proposed facilities. 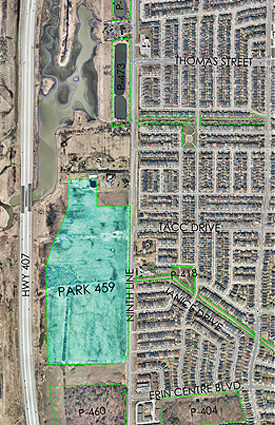 On September 30, 2015, Council approved a 25m pool and warm water tank at Churchill Meadows Community Centre & Park to be included in the Corporate Business Plan and Budget. The corporate report is available here. Council approved the budget to add the pool in December 2015. Public engagement sessions were held in 2015 to gather ideas and feedback from residents on the uses and recreational amenities for the park. Public input from the public engagement sessions is summarized in the following reports. Share your thoughts about Churchill Meadows Community Centre & Park by emailing the City at Ninthline.Park459@mississauga.ca.